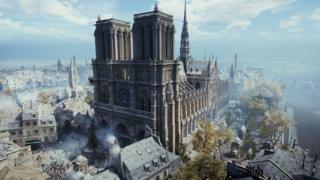 The company - which has its headquarters near Paris - stressed that although the in-game representation of the structure was elaborate, it was not 100% accurate. The in-game spire is different to the real one that caught fire, for example. This is because the spire has changed throughout the cathedrals's history. "While we wanted to be very precise with details, there are some differences in terms of scale and with some elements, " Ubisoft game developer Caroline Miousse told the BBC. "That being said, we would be more than happy to lend our expertise in any way that we can, to help with these efforts." The Ubisoft model isn't the only digital version of the cathedral. A replica of the Gothic building was made by the Vassar College historian Andrew Tallon, who died in 2018. His model is made up of laser scans taken from more than 50 locations around the building. Mr Tallon told the National Geographic in a video that the project is like "a giant detective puzzle". 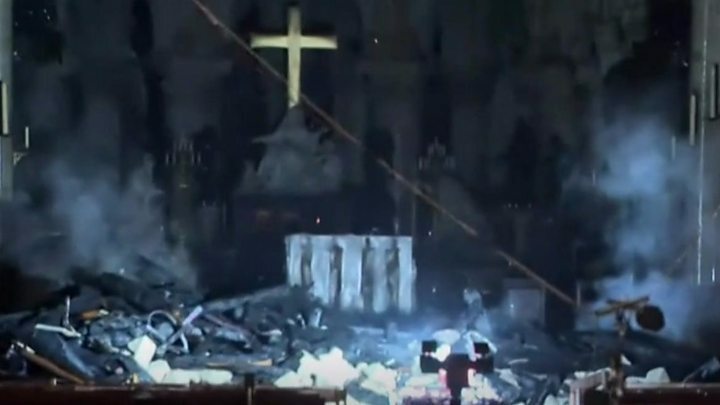 "It really goes back to the fascination I had as a child, as a nine-year-old kid looking at this big stone building, Notre-Dame, saying 'how did they do that?'" "Andrew's initial goal in laser-scanning Gothic buildings was to understand their structure on a granular level" explained Lindsay Cook, a visiting assistant professor at the US college. The images are made from a scan containing more than a billion data points, she told the BBC, which the college would be willing to share. "While it will be up to the French authorities and the architect responsible for the restoration to determine exactly how to proceed, Vassar - of course - stands at the ready to co-operate with their efforts if called upon to do so," she added.